A magical prom turns into a scorching hot mystery. 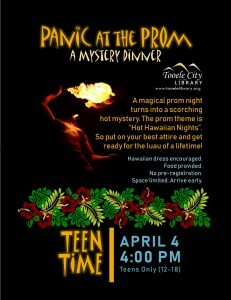 The prom theme is “Hot Hawaiian Nights”. So put on your best attire and get ready for the luau of your life! Hawaiian dress encouraged. Food provided. No pre-registration. Space limited. Arrive early.